Prologue: The Castle of the Wicked witch Carabosse. Carabosse is waiting to served dinner by her servants when two unexpected guests arrive. It is the King and the Queen who being barren, in desperation, has come to ask Carabosse for help in providing them with an heir. Carabosse gives the Queen a phial of magical powder and tells her: “Take this powder for the next month and by next year you will have a beautiful daughter. But she must be christened in this castle and live with me till she comes of age.” The Queen persuades the King to accept these conditions. The Christening Day of Princess Aurora. 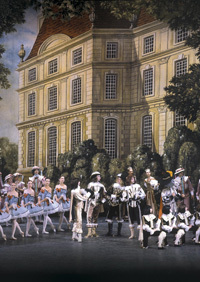 It is the following year and the courtiers are finishing the preparations for the christening of the newly born Princess Aurora in the Grand Hall of the Royal Palace. Catalabutte, the king`s close friend and First Minister enters and the Master of Ceremonies informs him that everything is ready. After some games the King enters and signs a decree gifting land, titles, and other presents to his courtiers in celebration of the birth of the princess. Catalabutte is disappointed not to be included. The queen arrives with the baby Princess and the King shows her the decree. She is surprised that Catalabutte is not listed. The King calls the Master of Ceremonies and it is revealed that Catalabutte is to made Marshall of the Kingdom. Aurora`s fairy godmothers arrive to bestow upon the infant princess their special graces .They wait for the fairy of Goodness and threatening noises are heard and panic ensues. The King and Queen understand that Carabosse has come. Quickly they tell the story of birth of the Princess to Catalabutte who tries to prevent the wicked witch from entering but it is too late. Carabosse demands to know why the promise has not been kept. Catalabutte takes all the blame on himself. In fury, she turns him into a donkey. The King gives her chests of gold but this does not satisfy Carabosse. As punishment she announces that on her 18 th birthday, Princess Aurora Will prick her finger on a red rose and die. In a attempt to save his infant the King hands Carabosse the deeds to the Kingdom. Carabosse rips up the deeds and repeats her spell. Suddenly the fairy of Goodness and Light enters. She announces that the Princess will not die but fall asleep. She dismisses Carabosse who leaves with threats to all. The Fairy of Goodness and Light completes the Christening. The King bans the growing of red roses and all thoughts of them on pain of death. Aurora`s Eighteenth birthday at her own palace, a birthday present from her parents. Servants of the household the Princess and the suitors who have come to woo her. The suitors appear. The King has invited a famous Chef from a foreign land to prepare the birthday feast. The Chef`s assistants a cake box. Catalabutte comes and the box is opened. Inside is a cake in the form of a basket of eighteen roses. Catalabutte shows them the Kings, decree of 18 years ago and orders them to be arrested. Hen the situation is explained to the King ,he says they must be hanged .The Queen convinces her husband that it is only a cake and that the foreigners did not know of the decree. The Kings pardons them all. As the excitement mounts, Aurora dances with each suitor. She is presented to the four princes. Aurora takes the pipe and dances with it in joy. The pipe turns into a rose stem. The crowd panics and try to take the rose from her. She keeps it to herself but pricks her finger on a thorn. She falls into her father`s embrace. The King pronounces his daughter dead and in the midst of the traumatized crowd Carabosse abandons her disguise and disappears. The Fairy of Goodness and Light appears and assures the court that Aurora is not dead, but will sleep instead, until awakened by the kiss of a handsome prince a hundred years hence. The crowd in their grief begs the fairy to put them to sleep as well. She casts a spell over the entire court, causing everybody but the King and Queen to fall asleep and a thick forest to grow around the palace. The King and Queen must stay to rule the Kingdom. They leave, knowing that they will never see their beloved child again. The Hunting Party of Prince Florimund. One hundred years later. Prince Florimund`s parents are looking for their son who is hunting in the forest. His tutor hears that he is approaching. He has killed a deer. The courtiers begin to entertain the Royal Party. They return to the forest to continue the hunt leaving Prince Florimund in the clearing. The Fairy of Goodness and Light appears and tell him the story of the sleeping Princess. The fairy conjures up an image of Aurora. Enamoured by this vision Florimund begs the Fairy to show him the path to Aurora`s resting place. She gives him a rose which will lead to her. Carabosse feels the approach of Florimund and sends her monstrous familiar to kill him. Florimund overcomes the beast and Carabosse and Florimund fight until eventually he pushes her into a bubbling cauldron and she dies. All the evil dies with her. The Awakening of princess Aurora. Prince Florimund finds himself amongst the sleeping courtiers. With the rose he awakens them, searching for the Princess. Catalabutte, restored to human form, shows him where she lies. He enters and places the rose upon her. She wakes and he asks for her hand in marriage. The Wedding of Princess Aurora and Prince Florimund. The Fairy of Goodness and Light explains to Aurora that whilst she slept many wonderful tales have been written and she is going to introduce the Princess to the main characters. They enter in procession and dance their stories. First comes Little Mook followed by Scheherazade. Then a knight enters followed by Beauty and the Beast who enact their story and then Cinderella, Bluebird, Puss in Boots, and finally Little Red Riding Hood. Aurora and Florimund dance a beautiful adagio and the Fairy of Goodness and Light blesses their union.